The Battle Honour NORMANDY LANDING is emblazoned on the Queen's Colours of The Royal Irish Regiment. 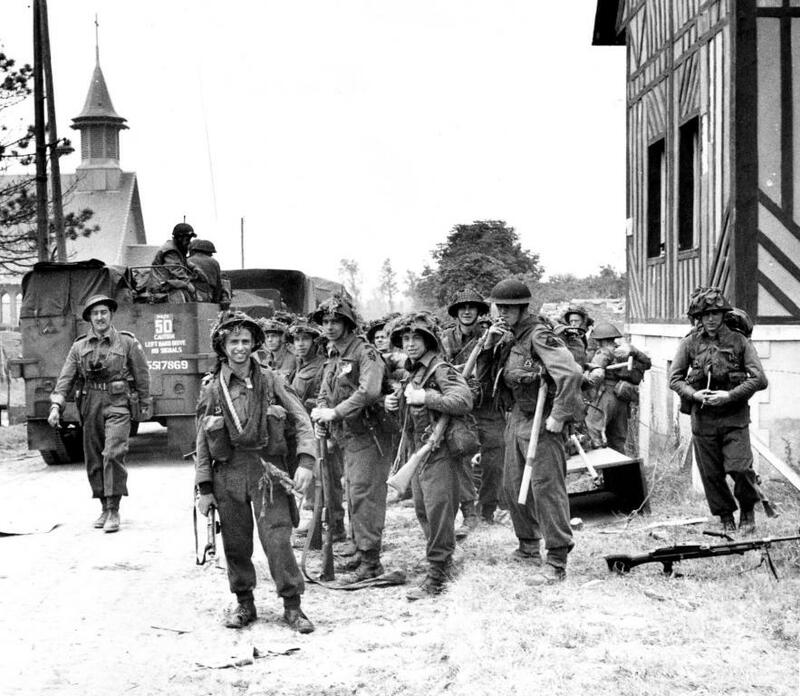 Both the 1st (Airborne) Battalion on Operation MALLARD and the 2nd Battalion The Royal Ulster Rifles on Operation NEPTUNE took part in Operation OVERLORD, the battle for Normandy, beginning on 6 June 1944. Operation NEPTUNE was the largest seaborne invasion in history. Lieutenant Colonel I C Harris commanding 2 RUR, part of 9 Brigade, the reserve brigade for 3rd Division, landed on the Queen Red Beach sector of Sword Beach. The Division’s post-landing objective included the city of Caen, some 15 km inland from Sword. The Battalion began landing at 1000 hrs just to the west of the village of Ouistreham and by late afternoon had sustained few casualties. Owing to the increasing sea swell, many Riflemen were soaked through, even before they landed. Some waded ashore in deep water because their landing craft beached short leaving them to carry their heavy kit, including a bicycle, through neck-high water. Later the Battalion moved to its assembly area at Lion-sur-mer, where it suffered some casualties from enemy artillery and mortar fire. 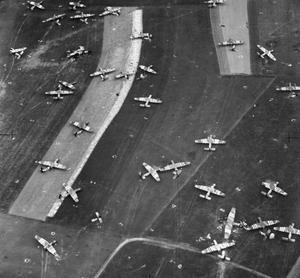 During the move out of the assembly area to that night’s hasty defensive position near Périers-sur-le-Dan, the sight of the gliders flying overhead caused one Rifleman to declare with some envy, ‘Look at them - that's what they call a route march’. Lieutenant Colonel R J H Carson, commanding 1 RUR, took off with the rest of 6 Airlanding Brigade on the evening of 6 June to begin Operation MALLARD, the airborne landing on the left flank of the British landing zone. At 2100 hours, six minutes earlier than planned, Major G P Rickcord and his B Company headquarters were the first Riflemen to land on LZ ‘N’ at Ranville. The other Horsa and Hamilcar gliders soon followed, and despite some earlier anti-aircraft fire, anti-glider obstacles across the LZ, and enemy mortar and machine-gun fire, the majority of gliders touched down to unload men, vehicles and equipment without loss - bar one missing. By 2330 hours, the Battalion had grouped successfully in the Ranville area. An hour after landing, the Commanding Officer received orders to capture the villages of Longueval and Sainte Honorine. Another Airborne RUR officer, Lieutenant Colonel T B H Otway, commanded the 9th Battalion The Parachute Regiment and his Battalion’s D-Day mission was to capture the coastal battery at Merville. The heavily fortified battery’s 150mm guns had to be destroyed to prevent them firing onto Sword Beach, the landing area for 3rd Infantry Division, which included 2 RUR. To read a personal account from aboard Landing Craft Infantry 375 carrying 2 RUR, please click on the attachment below.